We all know that children learn at a different rate and in a different way from adults. As a parent, you would know better than anyone else how teaching children involves different methods from teaching adults: simpler words and concepts, and techniques to engage their focus and concentration. This is why, at the Kung Fu Schools, we run age-specific Kung Fu classes to keep lessons fun, interesting, challenging, and more importantly, appropriate to your child’s age and learning stage. Our Little Dragons classes are tailored for children between 4 and 7 years of age, with a fully structured curriculum from beginners through to intermediates and advanced. 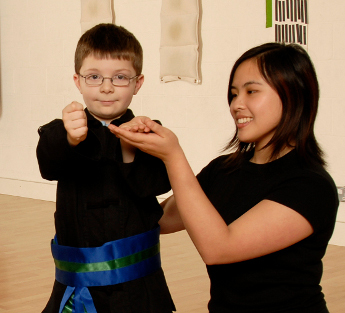 We aim to guide every one of our students towards their Little Dragon Black Belt and beyond! After all, a black belt is only a white belt that has never given up! Later, as your child gets older, we have Junior Classes for ages 8 to 12, which prepares children to move into the adult classes. All lessons are taught in a friendly and upbeat manner by fully trained instructors who are CRB-checked, and who have years of combined experience teaching children. We limit the number of children in a class, and maintain a small student to instructor ratio to ensure your child gets the most out of each and every lesson. Our two rules for all our kids are: to always try your best, and to always have fun! “I have been bringing both my children to your school for nearly a couple of years now. I have found a marked improvement in their confidence directly as a result of your weekly training. The classes are run in a very well structured and supportive way, always encouraging to bring out the best in the children, which is very important for young children embarking on a new form of out-of-school learning. The children have now got to know your staff and instructors and feel very comfortable being taught with such professionalism and in a fun and enjoyable way. In addition to the gentle form of martial arts movements, I have found the concepts being taught such as self-respect, self-control, and increased confidence very invaluable. This is evidenced every week, when I see the look on the children’s faces, as they are presented with awards, rewards and badges in recognition for producing a good piece of work, whether it was achieved at their school or in some other part of their lives. This continuous self-belief in their own abilities is second to none and is a must for children in today’s fast-changing world. Then Kung Fu Schools can help! As a parent, we can understand that while you want your child to develop into an academic and well-rounded individual, you also want them to have fun in the process. That is why we offer a no-obligation trial of 4 free lessons over two weeks, for your child to come and have a go! For Little Dragons, we offer an additional introductory lesson with one of our dedicated instructors to get them accustomed to us and to their surroundings. Trial lessons are limited and by appointment only, so contact us now to book yours in!